The runner’s heartbeat quickens to the beat, their legs jog to the rhythm of the song, and fast-paced music plays in their ears. What many athletes have in common is a workout playlist. Whether training for a race or lifting 10 pound dumbell weights, most people enjoy listening to their favorite tunes while working out. People usually listen to music to make their exercise more enjoyable and energetic. Along with this, music helps elevate moods when exercising and adds motivation to the workout. 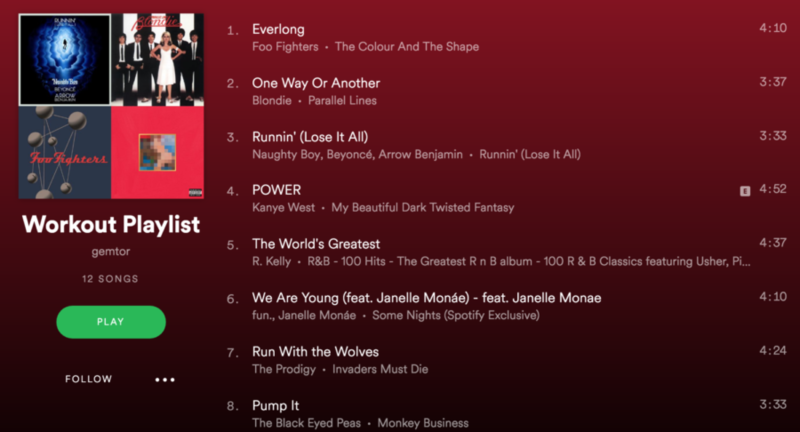 The most popular songs to exercise to are ones that are upbeat and fast in order to set the pace for the workout. “When I do listen to music that has an upbeat tempo that helps me maintain a faster pace,” track team sophomore Sabina Ortiz said. According to a survey done in 2012 by the Education Resources Information Center, 27.7 percent of people prefer listening to hip hop when working out, 24 percent prefer rock, 20.3 percent prefer pop, and the remaining percent prefer country music. From the same ERIC survey, people said they listened to music while exercising to endure their workouts longer and to make time pass faster. Palmetto students enjoy listening to music during their physical education classes as well. Psychologists have done extensive research and say there is a good rhythm to exercise at, which is around 120 beats per minute (bpm), or 2 beats per second according to the New England College. According to Independent News, there are some songs that are scientifically proven to be good workout songs based on the bpm level. “Everlong” by Foo Fighters will set a fast pace with 158 bpm. To speed up the workout a little, listen to “One Way or Another” by Blondie with 161 bpm. To slow down, play “Runnin’ (Lose It All)” by Naughty Boy feat. Beyonce and Arrow Benjamin at 140 bpm. To cool off, listen to “Power” by Kanye West at 77 bpm. So next time you are ready for your workout, plug in your earphones and listen to some music!